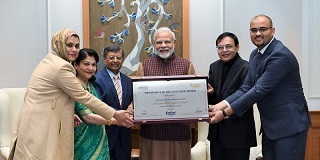 •	Prime Minister Narendra Modi was awarded first ever Philip Kotler Presidential Award. He was selected for his outstanding leadership for the nation. •	The Philip Kotler Presidential Award recognises and celebrates achievements of organisations, marketing teams, and individuals in different industries around the world. •	Philip Kotler is a world renowned Professor of Marketing at Northwestern University, Kellogg School of Management. •	The government announced winners of the Gandhi Peace Prize for four years beginning 2015 to 2018. •	It was last conferred to the Indian Space Research Organisation (ISRO)in 2014. The annual award, however, had not seen any winner since then. •	2015:Vivekananda Kendra, Kanyakumari, gets the award for 2015 for their contribution to rural development, education, development of natural resources. •	2016:For 2016, it has been jointly given to Akshaya Patra foundation for its contribution in providing mid-day meals to children and Sulabh International for its contribution in improving the condition of sanitation and emancipation of manual scavengers. •	2017:Ekal Abhiyan Trust has won the award for 2017 for their contribution in providing education for rural and tribal children in remote areas, rural empowerment, gender, and social equality. •	2018:Yohei Sasakawa for 2018, who is Goodwill Ambassador of the World Health Organisation for Leprosy Elimination, for his role in leprosy eradication. 1. It is given to individuals and institutions for their contribution to social, economic and political transformation through non-violence and other Gandhian methods. 2. A five-member jury, which included prime minister Narendra Modi, Chief Justice of India Ranjan Gogoi, Congress leader Mallikarjun Kharge, BJP leader LK Advani and Lok Sabha speaker Sumitra Mahajan, decided to confer the awards after detailed discussions on Wednesday. 3. The award was instituted in 1995 during the commemoration of the 125th birth anniversary of Mahatma Gandhi and is to be given annually. 4. It carries an award of Rs one crore, a citation a plaque and a handicraft item. Archbishop Desmond Tutu won the award in 2005. After a gap of eight years in 2013, Chandi Prasad Bhatt, noted environmentalist associated with Chipko Movement, received the prize. •	Renowned writer Namita Gokhale was awarded Sushila Devi Literature Award for her work “Things to Leave Behind”. She was honoured in the ‘Best Book of Fiction Written by a Woman Author’ category at the inaugural edition of Bhopal Literature and Art Festival. •	Sushila Devi Literature Award is constituted by Ratanlal Foundation. The award recognises the Best Book of Fiction Written by a woman author. It is a newly constituted award and comes with a cash prize of Rs 2 lakh. •	Namita Gokhale is an Indian writer, publisher and festival director who has authored sixteen books including nine works of fiction. •	Namita Gokhale is a founder-director of the ‘Jaipur Literature Festival’ along with William Dalrymple. She has also served as member-secretary of Indian Literature Abroad (ILA), an initiative by the Ministry of Culture.